CRESST developed the Multi-Mission Tactical Trainer (MMTT) Assessment Tool to provide the Surface Warfare Officers School (SWOS) a way to assess the performance of Tactical Action Officers (TAO) in a simulated Combat Information Center (CIC). 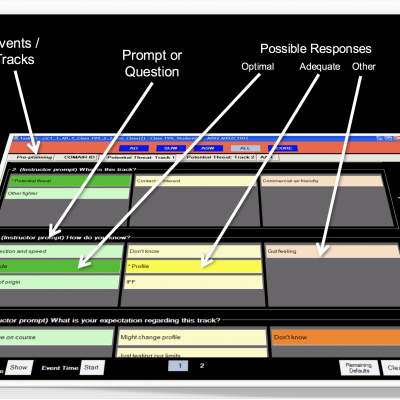 The tool provides a response matrix across multiple warfare areas (air, surface, and undersea), which serves to evaluate a student’s responses to various threats in a fast-paced, stressful environment. It also includes a place for a commanding officer (also in the room) to provide their evaluation. Using the Angoff Method’s standard-setting approach, students are graded on whether or not they are able to successfully complete their mission.